And we are finally here. I’m pregnant! After what it felt the longest and most arduous year of my life (yeah right?!) J and I are expecting our first child arriving in the winter. I waited for a long time to write this post, so far a few close friends and our family knows about our little Cookie. 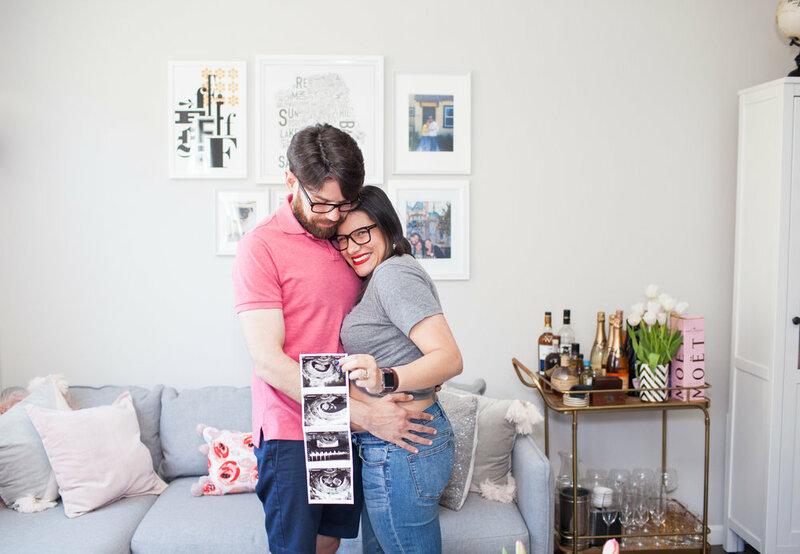 While I wanted to share it with you all, there are a few parts of me that wanted this to be a secret because I was (and still am) scared, I didn’t want to make a big announcement, and then having something happens to us. But, the point of a community like this is to be able to share my life, the struggles, and the happy news too. After finding the right doctor and a full year of eating right, working out, controlling my hormonal changes and prayers it finally happened. I remember being so heartbroken every time I got my period. I remember stressing over not being able to get pregnant, to feel like my body was failing me and the thing I was meant to do as a woman. I dealt with the defeat of getting my period every 29 days on the dot while all I wanted was to stop it. I cried after every negative test, after every pregnancy announcement I saw, but God's plans worked just right. It was back in March when Jorge and I met with my doctor, and she asked us to give it another try before we start considering the alternatives. Let's face it, the trying to make a baby is the best part. My doctor told me “you need to be less stressed, less tense to make this happen.” Well, she was right, I quit a job that made me miserable and kept eating, working out and being thankful for this body as much as I could, then my period went missing. I didn't want to take a pregnancy test because it felt like it wasn't going to happen this time, but Jorge didn't give up. Every day he asked, "did you take the test?" and nope, not wasting another one just to get my period shortly after that and just be miserable once more. One night, when my period was 5 days late, I went upstairs and did the deed: the 2 stripes appeared, and I yelled! Called J and within all my disbelief there it was: it happened. Being my pessimist self, I told him lets wait, don't get too excited this might not happen. He being his optimist (but cautious) person told me, "see, but at least we can make one!" and I took a second test to be sure, yep definitely pregnant. Jorge has been so amazing, I couldn't do this without him. We shared the news with our doctor and our parents first, but we asked them to keep it quiet for a few weeks. I'm not going to lie, for the first weeks of my pregnancy I realized that being scared is a huge part of this process. Worried about eating the right stuff, about that glass of rose I chugged right before my pregnancy test, about craving tuna salad, about my workouts. Worrying about every single thing because this little Cookie is a miracle to me, for this tiny human I prayed. Of course, we have seen the baby and my bump is small, but it's growing. Sometimes you can see it, but more often than not it looks like I ate 6 tacos instead of 2. But I know Cookie is there, moving and growing. Hopefully healthy and cozy there. So today because it's Father's Day (J's first!) and the joy we feel it's bigger than us, we wanted to share the news. Also, a bit of hope for those who are on this journey, it's not easy, sometimes it takes longer but, keep the faith, I have you in my prayers.